A view from the cycle path: The best cycle path in Britain ? One of my friends in Cambridge commented that this "almost looks like the Netherlands." That's true only until you notice that this path runs right next to high speed buses and that the junctions are all compromised. It's taken a lot longer than it should have (construction started well before we left Cambridge four years ago), but the Cambridgeshire Guided Busway has finally opened. With the busway came the best part of the plan, the maintenance track. 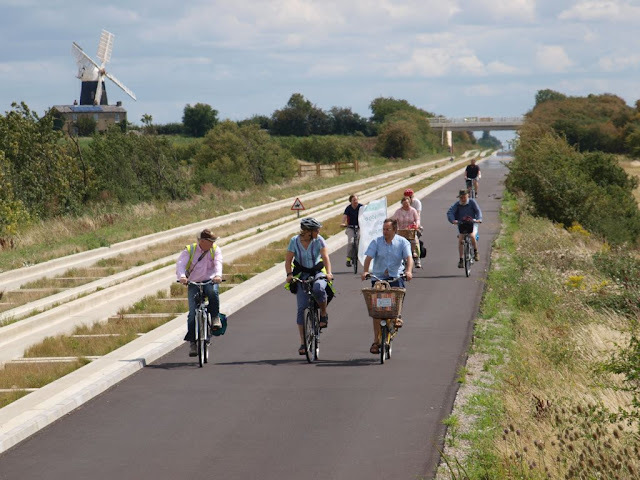 This is open for cyclists to use, and provides the first long distance cycle path in the area. It's quite a track. At four metres (maximum) wide, it's the same width as a standard bidirectional cycle path here in Assen. Unfortunately, the good quality section doesn't yet go the whole 26 km length of the bus route (hopefully, top-up money from a charity will complete it). The longest stretch being about 10 km in length between the North of Cambridge and the village of Swavesey, but this does appear to be surfaced nicely, providing a reasonably direct and high quality traffic-free route. When it's complete and goes all the way to St. Ives, this will be almost certainly the best quality cyclepath in the UK, offering a combination of a direct route to somewhere that you might actually want to go with a good degree of safety away from cars, with a width such that it's possible to pass other cyclists, and with a surface quality that allows cyclists to ride at any speed they find comfortable. This is undoubtedly a major improvement for Cambridge, and will enable a lot of people to make journeys that they'd not otherwise have made by bike. The previous route to St. Ives by bike was not bad at all by British standards, being mainly on minor roads, but there were a couple of less than pleasant parts. This path also is indicative of a problem. The best cycle facility in the area came into existence not as a cycling project but on the coat-tails of a bus project with an enormous budget. The costs for the guided bus are wildly higher than the budget for cycling could ever afford. Even though Cambridge is the leading cycling city of the UK, and as many people cycle there are take buses, funding in the area remains skewed towards motorized transport. That a charity is expected to fund finishing the path on behalf of cyclists shows the priority which cycling actually has in planning of this route. It also remains to be seen how popular the guided bus actually is. Originally, the bus was supposed to serve an "eco town" on the route, but this seems to be in planning limbo. If the bus fails, then the future of its "maintenance track" may also be in doubt. As there is no plan for a guided bus route from Cambridge to the West to reach St. Neots, East to Newmarket or South to Bishop's Stortford, there's no chance of an equivalent standard of cycle facility being built in those directions. While obviously welcome, recent provision from the cycling budget in the Cambridge area is not in the same scale nor the same standard as that which came piggy-backed on the bus project. I also have reservations about how crossings of roads are handled. If this was a Dutch style intercity cycling superhighway you'd expect to get priority at most, if not all, crossings so that a non-stop journey was possible. If a stop was required, you'd expect the delay to be short and that crossings of multiple lanes would be made in one step. But that's not the norm in Britain. These are things which could and should be improved over time. Perhaps most importantly, because this is a "one off" it's not part of a plan to build the one thing that made cycling really take off in the Netherlands. i.e. A tight grid of very high quality cycle paths. Because of this, the positive effect of this path will be limited only to people whose journeys are sufficiently lined up with its route. Let's end on a positive note. This still looks like it is the best cycle path in Britain. When finished it will provide for relatively uninterrupted riding over a good distance. I think it will be interesting to see what happens. As it's such a good facility, I expect it will be popular and well used. However, the difference in standard between this and other provision in the area will be obvious, and this could help to give impetus to a call for a general upgrade in standards. Cycling needs to have a proper budget in the UK's top cycling city. Clearly I spoke too soon regarding the quality of this path. It seems that in addition to the problems I suspected it would have, sections of this path flood for weeks at a time in winter. Really Cambridge, you need to do a lot better than this. This path was closed due to flooding this year for more than 50 days continuously. The same article also reveals that the closure last year was for 48 days continuously while the council actually intended for the path to flood for an average of 29 days each year. Perhaps it still is the best example of cycling infrastructure in Britain, but only for some of the year. For the rest of the year it's a pond. I've written elsewhere about the reason why Britain flood so readily. It's the same story as with cycling. Lack of investment. Britain's water management infrastructure isn't good enough to keep the country dry. In July 2016, a bus crashed off the guiding path and went up a bank. In March 2016, the bus left the guiding path, crossed the cycle-path and crashed into a bank. Now that crashes have occurred, we have to recognize that the maintenance path which doubles as a cycle-path clearly is not completely safe. Cyclists need their own infrastructure, specifically designed for cycling, not infrastructure which passes for cycling but which is really designed for motorised vehicles. There has now, sadly, been a fatal collision with a cyclist and an injury to a pedestrian on the guided bus tracks. These both happened on a stretch of the guided bus route to the South of the city rather than the stretch which I highlighted above, but the layout is the same and the same problems exist. Mixing high speed buses with pedestrians and cyclists in such close proximity is simply not ever a good idea. 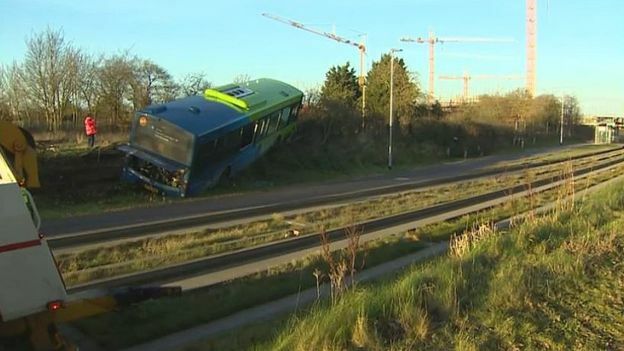 A spokesman for the bus company talking about the injured pedestrian said "We understand that a 39-year-old tourist was standing close to the busway track when he was caught by a bus wing mirror." This would not have been possible had there been a gap between where buses run and pedestrians walk. People should not be encouraged to stand so close to motor vehicles. These problems only arose because Cambridge finds it reasonable to under-fund cycling and walking infrastructure. Instead of building real high quality infrastructure for cycling and walking, those modes were placed on the maintenance track of an expensive project to promote use of motor vehicles. Thanks to Klaas Brumann for the photo at the top of the blog of the maintenance track. He has several more. When this blog post was originally written, the main media sources were more interested in the bus than the maintenance track and no-one was writing about the danger created by this layout. Those same news sources now have crashes and injuries to report upon. I still don't understand why they built this primitive but expensive concrete walled bus track using mechanical guidance with wheels poking out either side of the bus when it would have been rather less costly and quicker to have put a wire under a flat surface and guided the bus as in this example, itself part of a system more ambitious in its aims which was in full service many years before the work in Cambridge started. 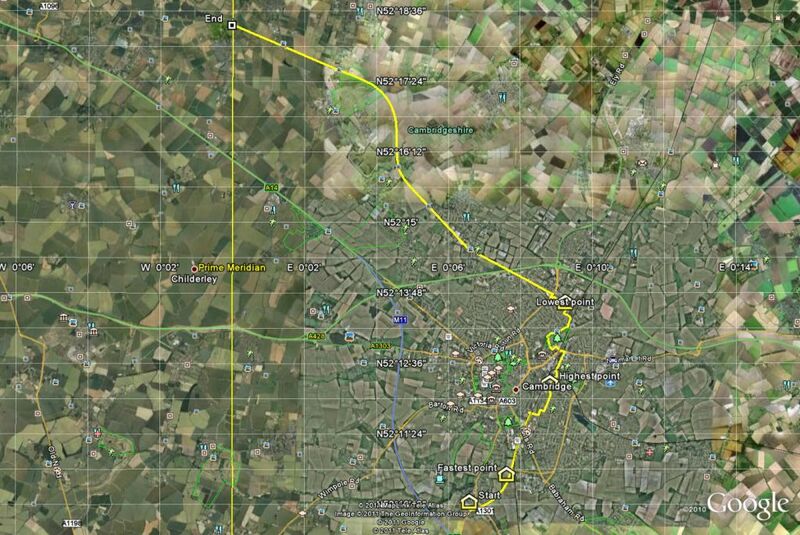 The guided bus way is built on the old Cambridge and Huntingdon railway, it would have been easer and cheaper to build the system as a Tram way. It takes the prize as the worlds longest guided bus way and perhasp the longest park and ride scheme too? I couldn't find out if you are able to take bikes on the buses but I did notice that there was no charge for parking a car which seems to be something of a subsidy for the car user. The bus tickets are good value and might even take cyclists off the route. 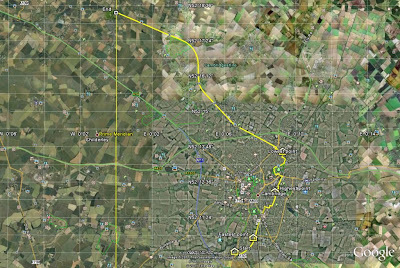 Everytime I go near this track there are cyclists on it, even out at Swavesey 10 miles from Cambridge. You will not see the same numbers of cyclists on the typical converted-footpath-next-to-a-road. This is a classic case of build it and they will come. I've already seen someone commuting in a suit on an electric bike and I am sure many more will follow. Apart from the safety, the best thing about this path is simply being able to cycle next to someone else and have a natter. And of course doing this whilst going somewhere instead of a circular recreational ride that you drove to. This is how to get people cycling. I think "best cycle path in Britain" might be a bit of an exaggeration. "Best in Cambridgeshire", yes, but I think the Chester Greenway (for example) is better: it's longer and doesn't have the awkward road junctions. According to the inspector's report, "LRT [light rail transport, i.e. a tram] would be significantly more costly than the CGB"
The busway runs past my house so it's nice to do a lap in the evening after work. I always meet (or get passed by) dozens of other cyclists doing the same thing. On other loops around the countryside I usually only see one or two determined time-triallists. Here's a photo I took this evening near Longstanton. "LRT [light rail transport, i.e. a tram] would be significantly more costly than the CGB"
I don't necessarily accept this, but stipulating for the sake of argument, LRT is significantly less costly to operate. The only long term advantage of a guided bus is that it may operate freely from the terminus. In some cases that advantage may be the overriding concern. It looks good. When visiting Cambridge earlier this year I really did do a double-take when I came across it. Just one question: If it's really a maintenance track how often do maintenance vehicles use it and what happens to cyclists when they do? 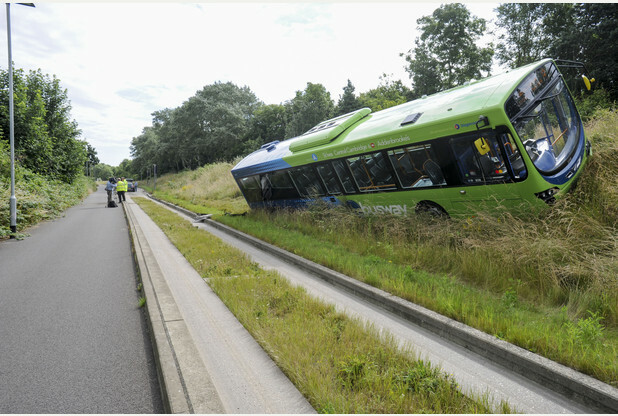 The first crashes came in 2012 (Long Stanton) but the busway fell into a big hole in regulatory terms. Un 2006 the enabling Act required that it would be managed as a tram system - but in 2006 the regulator (ORR) dropped busways when ROTS, became ROGS. In theory, the busway is not a public road - so the Council & Police processes for speed regulation & crash investigation don't apply. As a private premises it should come under HSAWA 1974 but until recently it has fallen through the cracks. The 2 Trumpington crashes (2016 - within 6 months & at the same location through same cause) began to wake the HSE up - here was a trail of bus derailments with an identical cause to the Croydon Tram crash - but because there was no longer a link between busways and tramways no one spotted the clear indicators. Early on I noted the lack of any safety zone between the dynamic envelope of the 56mph buses, and the traffic on the cycleway, and the derailments showed a lack of containment through barrier or special kerbs - you'll see photos on my tweets. 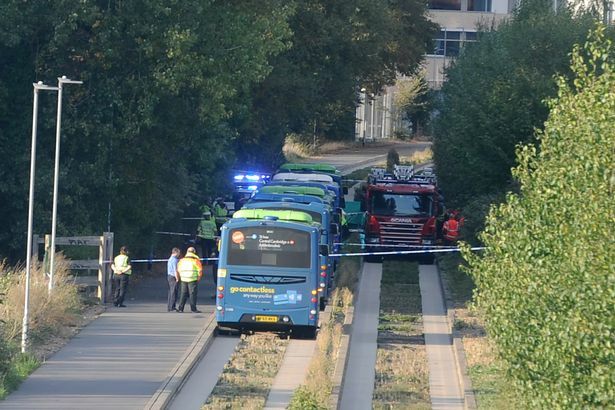 I'm keen to flesh out my spreadsheet on busway incidents, and aware of a slow speed collision between a bus and cyclist who had crashed into the kerb, plus cyclists crashing and falling on the busway (did incident warrant a RIDDOR report to HSC?) but getting picked off before a bus came along. The same detail applies to Dunstable and Leigh, but Dunstable has also had a head-on and a rear-end crash when a 50mph bus hit a broken down one (19 to hospital there). Just watch what develops!